The 2014 FIFA World Cup Final was a football match that took place on 13 July 2014 at the Maracanã Stadium in Rio de Janeiro, Brazil to determine the 2014 FIFA World Cup champion. Germany defeated Argentina 1–0 in extra time, with the only goal being scored by Mario Götze, who collected André Schürrle's cross from the left on his chest before volleying a high left-footed shot into the net. The match was the third final between the two countries, a World Cup record, after their 1986 and 1990 matches, and billed as the world's best player (Lionel Messi) versus the world's best team (Germany). Before the match, Germany had reached the World Cup final seven times (six times as West Germany from 1954 to 1990), winning three (1954, 1974, 1990) and being runners-up four times (1966, 1982, 1986, 2002); Argentina had reached four finals, winning twice (1978, 1986) and placing second twice (1930, 1990). The result marked Germany's fourth World Cup title and their first World championship as a unified nation. The victory meant that three consecutive World Cups have been won by teams from the same continent, following Italy and Spain in 2006 and 2010 respectively, the first time this has happened in World Cup history. It was also the first time that three consecutive World Cup finals were still tied after 90 minutes. The final marked the first time a World Cup hosted in the Americas was not won by a team from the continent. In the winning German team, Miroslav Klose, who had become the top scorer in World Cup history in the semi-final victory over Brazil, became one of the very few players ever to have won gold, silver and bronze medals in the World Cup (bronze in 2006 and 2010, silver in 2002 and gold in 2014), joining a club with earlier German players like Franz Beckenbauer, Sepp Maier and Wolfgang Overath (1966–1974), as well as Italian Franco Baresi (1982–1994). According to FIFA, 1.013 billion individuals globally watched the final match of this tournament. The two teams had met in 20 previous matches, with nine wins for Argentina, six wins for Germany and five draws. In these games, both teams had scored a total of 28 goals. Six of these matches were at a World Cup, two of them in the final. The 2014 final was the seventh World Cup match between them, equalling a tournament record for meetings between two teams (along with Brazil vs Sweden, and Germany vs Yugoslavia). The last three meetings were in three consecutive World Cups, having met in quarter-finals of 2006 and 2010 campaigns. 1958 FIFA World Cup Group 1, West Germany defeated Argentina 3–1. 1966 FIFA World Cup Group 2, West Germany and Argentina drew 0–0. 1986 FIFA World Cup Final, Argentina defeated West Germany 3–2 to win their second and most recent title. 1990 FIFA World Cup Final, West Germany defeated Argentina 1–0 to win their third title. It was Germany's last title as West Germany and the last before the 2014 Final. 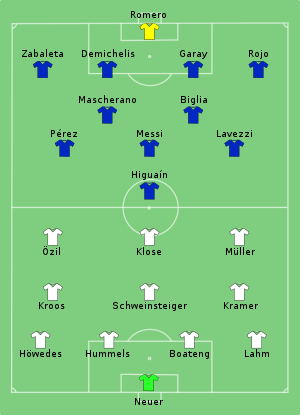 2006 FIFA World Cup quarter-finals, Germany defeated Argentina 4–2 on penalties (1–1 draw after extra time). 2010 FIFA World Cup quarter-finals, Germany defeated Argentina 4–0. In the 1966 FIFA World Cup, Argentina and West Germany played a 0–0 draw in the group stage. FIFA cautioned Argentina for its violent style against the Germans which saw Argentine Rafael Albrecht get sent off and suspended for the next match. The 1990 FIFA World Cup Final saw two Argentine players get sent off and West Germany won 1–0 due to a controversial penalty kick late in the match. The 2006 quarter-final game, where Germany won 4–2 in the shootout after the game ended 1–1, was marred by a post-match brawl caused by the Argentines, which resulted in suspensions for two Argentine players and one German player. 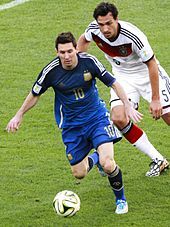 The most recent meeting between the two teams until the final, was a friendly match played on 15 August 2012 at Commerzbank-Arena, Frankfurt am Main, won by Argentina 3–1. Before the tournament, a friendly was scheduled for 3 September 2014, being the first match for both teams after the World Cup. Argentina won this meeting 4–2. Klose scored one goal in the 2006 meeting and two goals in the 2010 meeting, while Müller scored one goal in the 2010 meeting. Germany manager Joachim Löw was the assistant manager in 2006 and the manager in 2010. The match ball for the 2014 FIFA World Cup Final, announced on 29 May 2014, featured a variation of the Adidas Brazuca named the Adidas Brazuca Final Rio. Whilst the technical aspects of the ball were the same, the design was different from the Brazuca balls used in the group stages and other playoffs, with a green, gold and black coloring. It was the third special ball for FIFA World Cup final matches, after the +Teamgeist Berlin (2006) and the Jo'bulani (2010). Nicola Rizzoli, from Italy, was named as the referee of the final, together with fellow Italians Renato Faverani and Andrea Stefani as the assistant referees, and Carlos Vera and Christian Lescano from Ecuador as the fourth and fifth officials. Earlier in the 2014 World Cup, Rizzoli took charge of the Spain–Netherlands and Nigeria–Argentina matches in the group stage, and the Argentina–Belgium quarter-final. He had previously taken charge of the 2010 UEFA Europa League Final and the 2013 UEFA Champions League Final. He was also one of the referees at the 2011 FIFA Club World Cup, UEFA Euro 2012 and the 2013 FIFA U-20 World Cup. He became the third Italian referee to take charge of a World Cup final, after Sergio Gonella in 1978 and Pierluigi Collina in 2002. Both teams named unchanged starting line-ups from their semi-finals, but German midfielder Sami Khedira withdrew during the warm-up with a calf injury. He was replaced by Christoph Kramer, who had made two brief substitute appearances during the tournament. Kramer himself suffered a head injury after a collision with Ezequiel Garay inside the penalty area, but was initially cleared to continue playing. Fourteen minutes later in the 31st minute however, he collapsed to the ground, apparently suffering from concussion and was replaced by André Schürrle. Argentina's Lionel Messi (front) battles Germany's Mats Hummels for the ball. Argentina striker Gonzalo Higuaín challenging Germany goalkeeper Manuel Neuer. Argentina's Gonzalo Higuaín missed a good opportunity in the first half, dragging his shot wide after being put through on goal by a misjudged header from Toni Kroos. He had a goal disallowed later in the first half, when he was ruled offside after tapping in a cross by Ezequiel Lavezzi from the right wing. Germany responded when Thomas Müller raced into the penalty area and cut the ball back for Schürrle, who saw his first-time effort saved by a diving Argentine goalkeeper Sergio Romero. As the half ended Germany had a brief flurry of chances, the closest coming when Benedikt Höwedes' header hit the post from a corner during injury time. In the second half Lionel Messi missed an early opportunity when he fired wide of the German goal from inside the penalty area after receiving a through pass, but the remainder of the half saw fewer chances with the closest coming from a Toni Kroos shot that went wide in the 81st minute. In the 88th minute, Germany’s all-time leading scorer Miroslav Klose was substituted for Mario Götze. This would be Klose’s final appearance for Germany. In the second half of extra time Mario Götze of Germany scored the winning goal in the 113th minute. Schürrle raced past two defenders on the left before crossing into the penalty area, where Götze controlled the ball on his chest and then volleyed left-footed into the net. He became the first substitute to score a World Cup-winning goal, as well as the youngest player to score in a World Cup Final since German Wolfgang Weber in 1966 (same age, 22). Thomas Müller had a chance to double Germany's lead shortly afterward when he dribbled past two defenders, but his shot across the net was too wide. Late in extra time, Messi had an opportunity to equalise from a free kick within goal-scoring distance, but his attempt flew high over the crossbar. In addition to Klose, Germany captain Philipp Lahm and veteran defender Per Mertesacker, a late substitute, announced that the final would also be their last match for Germany. Combined, these three players had amassed 354 appearances for the national team between them. Due to the Argentina–Brazil football rivalry, the Brazilians in the crowd supported Germany, despite their resounding 7–1 victory over Brazil in the semi-finals, as the Germans had shown respect to the defeated hosts, while Argentine fans had celebrated Brazil's elimination. Most Brazilians were reportedly relieved that their rivals did not win the World Cup in Brazil's iconic home stadium. Chancellor of Germany Angela Merkel (left) attended the final. 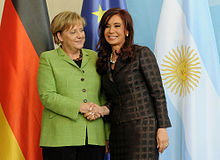 However, President of Argentina Cristina Fernández de Kirchner (right) was absent due to illness. Brazilian President Dilma Rousseff invited the BRICS leaders to the final ahead of the 6th BRICS summit. Among those who showed up were Vladimir Putin, the President of Russia, the next World Cup hosts, and Jacob Zuma, the President of South Africa, the previous hosts. Other world leaders Viktor Orbán (Hungary), Ali Bongo Ondimba (Gabon) and Gaston Browne (Antigua and Barbuda) also attended the event, which led The Guardian to label the guest list "bizarre and random", as those countries were failed to qualify for this World Cup. German President Joachim Gauck and Chancellor Angela Merkel were present for the final. Merkel already watched the Germany vs. Portugal match in Salvador, when the German team won 4–0. The President of Argentina, Cristina Fernández de Kirchner, did not attend because of both her grandson's birthday and a case of pharyngo-laryngitis. Russian comedian Vitaly Zdorovetskiy ran onto the pitch during the match with "Natural Born Prankster" written across his torso and attempted to kiss Benedikt Höwedes of Germany. Brazilian authorities arrested him, and he was released hours after the match. Several celebrities also attended the final, including Rihanna, Mick Jagger, David Beckham, Ashton Kutcher, Daniel Craig, Tom Brady, and LeBron James. Former World Cup winners like Fabio Cannavaro, Lothar Matthäus, Daniel Passarella – who all had won the World Cup as captains – and Pelé were present as well. Germany captain Philipp Lahm lifts the World Cup trophy. The closing ceremony took place about an hour and forty minutes before the final. A performance of two acts, the ceremony lasted about 20 minutes. The first act featured 22 samba dancers and a host of other performers, with 32 of the dancers wearing dresses decorated in the colours of the 32 participating teams. The second act featured musical performances headlined by Colombian singer Shakira, and included singers Carlinhos Brown, Wyclef Jean, Alexandre Pires, Ivete Sangalo and guitarist Carlos Santana. Brazilian supermodel Gisele Bündchen and Carles Puyol, a member of Spain's winning team in 2010, unveiled the FIFA World Cup Trophy. President Rousseff of Brazil delivered the trophy to German captain Philipp Lahm during the awards ceremony on the stands. Alongside her during the trophy handover was FIFA president Sepp Blatter. As Lahm raised the trophy, the outro of the tournament's official song "We Are One (Ole Ola)" was played. ^ "Tactical line-up – Germany–Argentina" (PDF). FIFA.com. Fédération Internationale de Football Association. 13 July 2014. Retrieved 14 July 2014. ^ "Groups & Schedule". BBC Sport (British Broadcasting Corporation). Retrieved 14 June 2014. ^ "Matches". FIFA.com (Fédération Internationale de Football Association). Retrieved 14 June 2014. ^ "Franz Beckenbauer". Planet World Cup. Retrieved 16 July 2014. ^ "Sepp Maier". Planet World Cup. Retrieved 16 July 2014. ^ "1966 FIFA World Cup England: England – Germany FR match report". FIFA. Retrieved 16 July 2014. ^ "Wolfgang Overath". Planet World Cup. Retrieved 16 July 2014. ^ a b "2014 FIFA World Cup™ reached 3.2 billion viewers, one billion watched final". FIFA.com – Media Release. FIFA. Retrieved 4 November 2017. ^ "1966 FIFA World Cup Match Report: Germany FR – Argentina". FIFA.com. Archived from the original on 9 July 2014. ^ "History of the World Cup". fifaworldcup.webspace.virginmedia.com. Archived from the original on 24 February 2014. Retrieved 15 June 2014. ^ Alsos, Jan. "1966 – Story of England '66". Planet World Cup. Archived from the original on 12 June 2010. Retrieved 3 June 2010. ^ Walker, Michael (30 June 2006). "World Cup 2006: Mass brawl marrs quarter-final". the Guardian. Retrieved 16 June 2018. ^ "Players brawl after penalty heartbreak for Argentina". Mail Online. Retrieved 16 June 2018. ^ "Argentine pair banned over brawl". 8 July 2006. Retrieved 16 June 2018. ^ "Fifa fury at Berlin match fracas". 5 July 2006. Retrieved 16 June 2018. ^ "Germany 1 Argentina 3". Goal.com. 15 August 2012. Retrieved 9 July 2014. ^ "Schedule". Deutscher Fussball-Bund. Retrieved 13 July 2014. ^ "Miroslav Klose breaks Ronaldo's record to become the top scorer in World Cup history". Daily Mail. 8 July 2014. Retrieved 9 July 2014. ^ a b "adidas Brazuca Final Rio unveiled". FIFA.com. Fédération Internationale de Football Association. 29 May 2014. Retrieved 14 July 2014. ^ a b "Nicola Rizzoli to referee Final". FIFA.com. 11 July 2014. ^ "Germany's Christoph Kramer asked referee: 'Is this the final?'". The Guardian. 17 July 2014. Retrieved 10 April 2017. ^ "Germany 1 Argentina 0". BBC Sport. 13 July 2014. Retrieved 14 July 2014. ^ "World Cup final 2014, Germany vs Argentina: as it happened". Daily Telegraph. 13 July 2014. Retrieved 14 July 2014. ^ "Germany beat Argentina to win World Cup final with late Mario Götze goal". The Guardian. 13 July 2014. Retrieved 14 July 2014. ^ Presenter: Gary Lineker (13 July 2014). "Match of the Day Live". 2014 FIFA World Cup: World Cup Final. Event occurs at 4:07:29. BBC One. Do you know, that's the first substitute to score a winning goal in a World Cup final? ^ "Messi's World Cup ends on a bitter note". CBS. Associated Press. Retrieved 22 July 2014. ^ "What happened to Germany's World Cup winners?". ESPN. ESPN. Retrieved 2 November 2018. ^ "Match report – Germany 1–0 Argentina" (PDF). FIFA (Fédération Internationale de Football Association). 13 July 2014. Retrieved 14 July 2014. ^ Young, James (13 July 2014). "Brazil falls short, but its World Cup provides unforgettable theater". Sports Illustrated. ^ Brunner, Cody (13 July 2014). "Argentina's World Cup final loss to Germany gives Brazil something to cheer about". Yahoo. ^ "Brazilians Go Back to Real Life". The New York Times. 13 July 2014. ^ "Vladimir Putin to attend World Cup final in Brazil". The Voice of Russia. 20 September 2013. Retrieved 11 July 2014. ^ "Zuma to watch World Cup final". The Citizen. South African Press Association. 13 July 2014. Archived from the original on 15 July 2014. Retrieved 13 July 2014. ^ "World Cup final guest list has bizarre and random look". The Guardian. 13 July 2014. Retrieved 14 July 2014. ^ Camargo, Marcelo (25 January 2014). "Germany chancellor and president to watch final at Maracanã". Agenciabrasil.ebc.com.br. Retrieved 11 July 2014. ^ Payne, Marissa (13 July 2014). "Argentina's president isn't attending the World Cup final because of grandson's birthday". Washington Post. Retrieved 14 July 2014. ^ "World Cup 2014: Moment streaker invades pitch and attempts to KISS German star". Daily Mirror. 13 July 2014. Retrieved 14 July 2014. ^ a b "World Cup closing ceremony 2014 sees Shakira, Rihanna, David Beckham, Pele, Tom Brady, Vladimir Putin and more in the crowd as celebrities spotted at Maracana in Rio de Janeiro for final". Daily Mail. 13 July 2014. Retrieved 30 October 2015. ^ Maese, Rick; Phillips, Dom (13 July 2014). "2014 World Cup draws to a close in conflicted Brazil". The Washington Post. Rio de Janeiro. Retrieved 13 July 2014. ^ "World Cup 2014: Best selfies". The Daily Telegraph. Retrieved 17 July 2014. ^ "Former internationals Lothar Matthaeus, Fabio Cannavaro and Daniel Passarella take a selfie the WC 2014 Final match". Veooz. Archived from the original on 26 July 2014. Retrieved 17 July 2014. ^ "Closing ceremony to celebrate Brazil 2014 in style". FIFA. 12 July 2014. Retrieved 13 July 2014. ^ "Shakira, Santana Electrify World Cup 2014 Closing Ceremony". NDTV. 13 July 2014. Archived from the original on 14 July 2014. Retrieved 13 July 2014. ^ "Shakira headlines fairly normal World Cup closing ceremony". CBC.ca. 13 July 2014. Retrieved 13 July 2014. ^ "Puyol, Gisele to unveil Trophy prior to the Final". FIFA.com. Retrieved 11 July 2014. ^ "Dilma Rousseff Confirms She Will Hand the Trophy to the World Cup Winner and Says Boos "Are Part of the Job"". Folha de S.Paulo. Retrieved 11 July 2014. ^ "Brazil defeated pessimistic predictions for the World Cup -Rousseff". Reuters. Thomson Reuters. 15 July 2014. Retrieved 8 August 2018. ^ "Philipp Lahm of Germany is presented with the World Cup trophy by Brazilian President Dilma Rousseff and FIFA President Joseph S. Blatter". Getty Images. 15 July 2014. Retrieved 8 August 2018.